Fill a small microwavable bowl half full with water. Add broccoli to bowl and cook in microwave for 2 minutes, so broccoli is lightly steamed. Preheat oven to 450*F and dust pizza pan with flour. Roll or toss pizza dough out to be the size of baking pan. Place dough on pan. Using the bottom of a large spoon, spread alfredo sauce on dough until well covered. Sprinkle a handful of mozzarella on top. 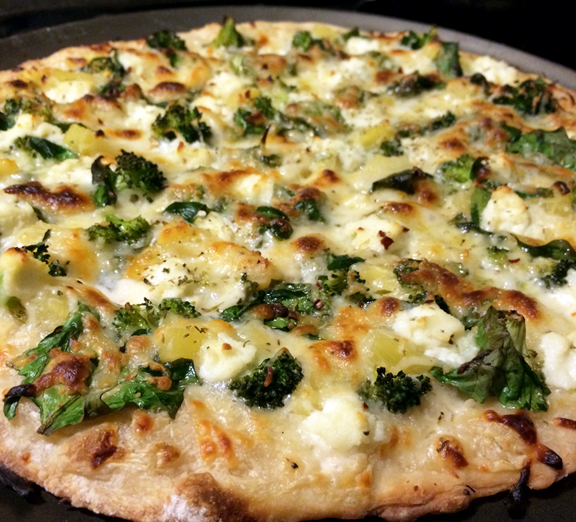 Distribute Broccoli and spinach (and pineapple) evenly over dough and top with remaining mozzarella. Using a teaspoon, drop spoonfuls of the ricotta evenly over pizza. Drizzle top of pizza lightly with honey. Bake 15-20 minutes or until crust is golden and cheese is bubbly.